Orchestrated by the esteemed auction house Phillips, The Rake has styled 12 looks that have been paired with 12 very rare and unique timepieces which will be going under the hammer on December 5th in New York. Jacket by Sciamat; Shirt by Cordone 1956; Tie by Turnbull & Asser; Pocket square by Rubinacci; Trousers by Cifonelli; Loafers by Baudoin & Lange; Umbrella by George Cleverley; Watch by Patek Philippe. The coming together of Mr Porter, Phillips and The Rake through a shared love of watches was undoubtedly a seminal moment in the ever-changing menswear landscape. On the surface, it might appear to be an unlikely pairing. But, with the shared mission of uniting the sartorial and horological worlds, the result of two major players in online retail joining forces with Phillips and the inimitable Aurel Bacs, was only going to be special. So here we are, the outcome: 12 expertly styled looks have been put together by The Rake's Grace Gilfeather with a specific situation in mind. Each sartorial moment has its own criteria: from being positioned at the end of the bar surrounded by snow, to being at the end of the aisle surrounded by loved ones, the unifying modus operandi concerns exceptional feats of horology demonstrated through one of 121 vintage timepieces. On the 5th of December, each one will be going under the hammer at the ‘Styled: Timeless Watches and How to Wear Them’ auction, held at Phillips in New York. If you're keen to take a look at what's on offer, have a look at all 121 lots here via Phillips' website. Alternatively, a digital version of the catalog is also an option. The idea that one should dress appropriately and stand out for the right reasons is a shared tenet between Mr Porter and The Rake. As Mr Porter's Toby Bateman said at the panel discussion at Phillips’ London HQ last month, he wants people to “just dress better.” With that in mind, whether you’re attending Wimbledon in the summer or a black tie event this upcoming festive season, sticking to the simple codes of dress that have been slowly but surely carved into our common consciousness is to be expected. With that mind, though, it doesn’t stop at garments, as the aforementioned codes of dress are also applicable to one’s timepiece. For example, you shouldn't wear a vintage Tag Heuer Autavia Ref. 2446 'Jochen Rindt’, with its curvaceous crown and sporty pushers, at the dinner table when evening dress is de rigueur. However, it would be better suited clasped to one’s wrist on the periphery of the racetrack at Goodwood. On the other hand, a unique diamond-set dial and platinum Patek Philippe is far too precious for anything verging on the adventurous and will be more accustomed to genteel settings slightly hidden beneath the double-cuff of one's dress shirt. Coming in at a close second after Royal Ascot, Wimbledon is the sporting fixture of the year when dressing appropriately is strongly encouraged and expected. They're both very different, though, in terms of formality, so having an understanding of how to wear separates is key. A fail-safe combination is a navy jacket or blazer with a neutral trouser. 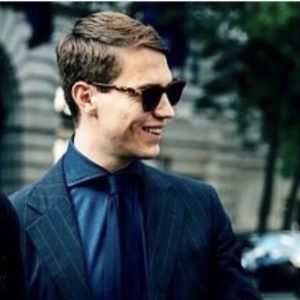 Sciamat’s double-breasted blazer is a statement with its hefty lapels, but worn tastefully with a blue Bengal stripe shirt and repp tie, becomes tastefully muted. The umbrella is to complete the look, as you never know what weather you're going to get in SW11. Jacket by Sciamat; Shirt by Cordone 1956; Tie by Turnbull & Asser; Pocket square by Rubinacci; Trousers by Cifonelli; Loafers by Baudoin & Lange; Umbrella by George Cleverley; Watch is a very rare 2009 Patek Philippe chronograph in platinum. Due to the sheer expanse of works on show, events such as Art Basel can be rather exhausting. So, combat the inevitable tiring day by wearing comfortable clothing, such as a cashmere collarless shirt, white sneakers and a deerskin flight jacket from Valstar. The paired watch here on this occasion is a work of art in itself with a stunning polychrome cloisonné enamel dial depicting a map of the world. Jacket by Valstar; Shirt by Santillo 1970; Jeans by The Worker’s Club; Scarf by Anderson & Sheppard; Trainers by Grenson; Sunglasses by Oliver Goldsmith; Watch is a 1996 Vacheron Constantin ref 43050 with polychrome cloisonné enamel dial in 18K yellow gold. Having a multitude of pockets to utilize when on safari is incredibly practical, and Grenfell’s Shooter jacket is designed to be worn out in the field. Offset with a navy floral scarf and brought together with a pair of cream trousers and suede Chukka boots, the finishing touch is a Panama hat which will help keep the sun out of your eyes. An adventurous watch will no doubt help, and Breitling is known for its intrepid timepieces. Jacket by Grenfell; Shirt by Emma Willis; Scarf byAnderson & Sheppard; Trousers by Rubinacci; Boots by Ludwig Reiter; Hat by Lock & Co; Watch is a circa 1955 Breitling Navitimer ‘Pre-806’ in stainless steel. There are three ensembles that one can get married in; a morning suit, a tuxedo and a lounge suit. The latter is the least formal, but nevertheless can be just as elegant if done correctly. A three-piece, single-breasted suit will help you make a statement on the day of your nuptials. Playing off conservative hues of navies and greys, a white shirt, ideally with a long-point collar, is customary and will help frame your head. With your tie and pocket square playing off each other ever so slightly but never matching, finish off the look with a pair of finely-polished Oxfords. Add in a classic dress watch with a champagne dial to the equation and you're ready to say 'I do'. Three piece suit by Cifonelli; Dress shirt by Turnbull & Asser; Tie by Emma Willis; Pocket square by Rubinacci; Socks by The London Sock Compan; Shoes by Edward Green; Watch, an oversized 1964 Champagne dial Patek Philippe. There’s no greater coat to be worn on the sidelines as a fleet of roaring, classic automobiles rip around the famed Goodwood track than the Despatch Rider coat from Grenfell. Conceived to be worn by despatch riders in World War One through all kinds of weather, it’s durable and stylish and looks particularly handsome with a smart, tailored ensemble beneath. With a coat such as this, it's only fair that one's wrist reflects its heritage, and Tag Heuer has an impressive longstanding history with automobile racing. Coat by Grenfell, Roll neck by Anderson & Sheppard, Jacket by Walker Slater, Trousers by Anderson & Sheppard, Boots by Gaziano & Girling; Watch is a rare Tag Heuer 1966 chronograph with contrasting subdials in stainless steel. Marrying Italian flare with British-made quality goods will help make anyone look like they mean business. Lardini’s wares are not only great value but extremely well-cut and this windowpane two-piece suit adds a little extra to a typical business ensemble. Paired with honestly-made accessories and leather goods, you’ll own the boardroom. With this Patek Philippe on your wrist, you'll most likely own the company. Suit by Lardini; Shirt by Turnbull & Asser; Tie by Drake’s; Case by Ettinger; Shoes by Edward Green; Watch is a Patek Philippe 1928 single pusher ‘Officer’ chronograph with Breguet numerals in 18K yellow gold. 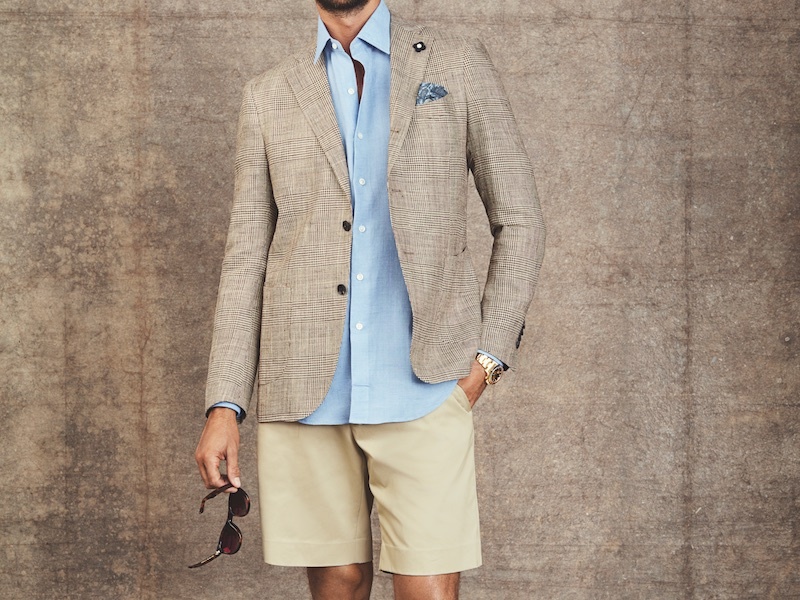 Exploring the Caribbean has certain demands, and in terms of clothing, it pays to take a sensibly lightweight approach to fabrics, with linen being top of the pile. Rubinacci’s double-breasted cream jacket is simply sublime and looks particularly louche with a silk scarf tied around the neck. Being in the tropics, it's only right that you sport a tropical dialed watch, and this vintage Rolex GMT with a two-tone bezel will perfectly complement one of the island's finest rum punches. Jacket by Rubinacci; Shirt by Edward Sexton; Neck tie by Fumagalli 1891; Trousers by Edward Sexton; Socks by The London Sock Company; Loafers by Baudoin & Lange; Sunglasses by Oliver Goldsmith; Hat by Lock & Co; Watch is a very rare Rolex 1965 GMT-Master with tropical gilt glossy dial in stainless steel. One of the best parts of a day’s skiing is taking off one’s boots. Aside from the instant relief, it also harkens the beginnings of apres-ski, a vital ritual. Propped up at the bar with a Glühwein in-hand, a chunky, cable-knit jumper paired with a melton-wool gilet is an assured choice and will make you appear as if you know exactly what you’re doing if you happen to be new to the sport, an impression made unquestionable with the addition of a classical Vacheron Constantin from 1970 on your wrist. Gilet by Grenfell; Roll neck Inis Meain; Trousers by Alps & Meters; Watch is a very rare Vacheron Constantin 1970 with a rotating bezel in yellow gold. A cream shawl lapel dinner jacket oozes sophistication and eludes to a Humphrey Bogart-esque demeanour. An excellent alternative to stand out in compared to the go-to single-breasted black jacket, Gieves & Hawkes’ iteration is flatteringly cut with one button and jetted pockets. With eveningwear, it's very straightforward as to what kind of timepiece you should wear: a platinum dress watch set with diamonds because why the hell not? Suit by Gieves & Hawkes; Shirt by Turnbull & Asser; Bow tie by Cifonelli; Shoes by George Cleverley; Cufflinks by Deakin & Francis; Watch is a Patek Philippe circa 1950 with a possibly unique reference in platinum with a diamond-set dial. Although a while away, there’s nothing quite like being in Positano in summer. The aquatic hues of the crystal blue ocean and an easy breeze is a feeling to behold. If you happen to have docked-up for lunch, linen is your port of call for fabrics. Lardini’s unlined linen/silk Prince of Wales check blazer is an elegant choice, and brought together with a light blue shirt and Riviera loafers, you’ll have every head in the restaurant turning, especially if the bezel of your Rolex is multi-coloured. Jacket by Lardini; Shirt by Emma Willis; Pocket Square by Rubinacci; Shorts byAnderson & Sheppard; Loafers by George Cleverly; Sunglasses by Oliver Goldsmith, Watch is a very rare Rolex Daytona with diamond and rainbow-coloured multi-gem set in yellow gold. It’s safe to presume that watch enthusiasts could be a little bit judgemental when it comes to their peers’ own timepieces. Of course, there are massive amounts of respect between watch industry folk, but when a gathering is around the corner, surely it’s a great reason to pull out something special and let your wrist do the talking. If you’re heading to your own gathering, don’t overthink it: dress casually and comfortably. A neutral ensemble with a flash of colour thanks to some punchy socks should do the trick if a very rare 1951 Rolex Padellone doesn't (which of course, it will). Jacket by Huntsman; Shirt by Emma Willis; Pocket Square by Rubinacci; Hat by Lock & Co; Trousers by Edward Sexton; Socks by The London Sock Company; Loafers by Cheaney; Watch is a Rolex ‘Padellone’ ref 8171, circa 1951 with two-tone dial in 18k yellow gold. New York’s playground, the Hamptons, lives up to its reputation of being a stylish and sophisticated retreat of the Big Apple’s jet-setting inhabitants. As such, a smart casual appearance is advised, with separates being the easiest choice. 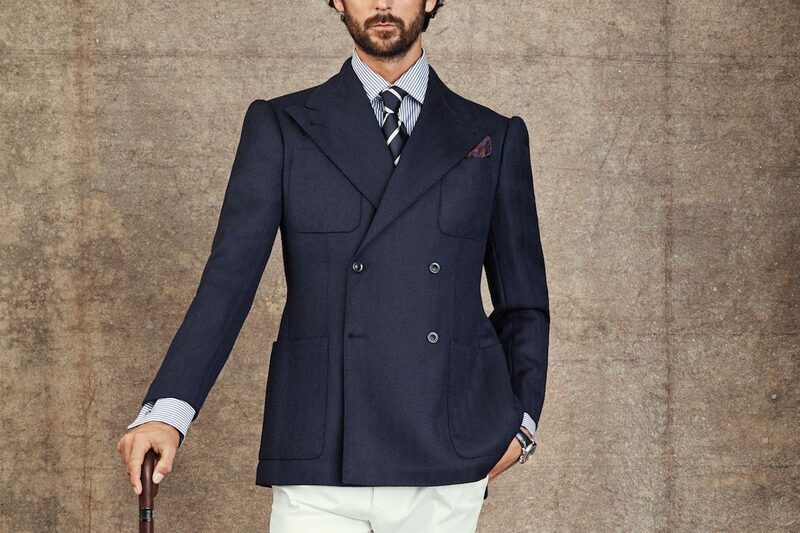 The combination of a classic navy, single-breasted blazer with cream, slim-cut trousers is an emphatic home run. Finish the look with a pair of espadrilles and an elegant Patek Philippe dress watch and you’re good to go. Jacket by Rubinacci; Shirt by Marol; Tie by Fumagalli 1891; Espadrilles by Manebi; Watch is a Patek Philippe 1955 with enamel dial in yellow gold. Positano: Summer in the Mediterranean: Jacket by Lardini; Shirt by Emma Willis; Pocket Square by Rubinacci; Shorts by Anderson & Sheppard; Loafers by George Cleverly; Sunglasses by Oliver Goldsmith, Watch is a very rare Rolex Daytona with diamond and rainbow-coloured multi-gem set in yellow gold.